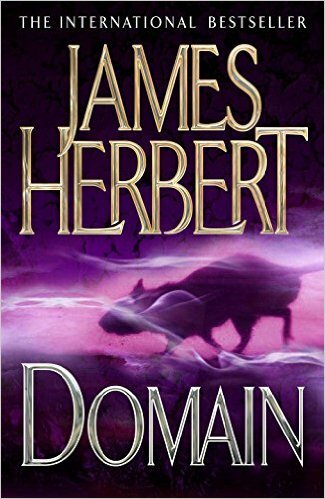 Domain is the third book in James Herbert’s Rats series. Once again the rats have returned and they are as vicious and deadly as ever, but this time around the characters have other things to worry about apart from the rampaging rodents. The place is London; the time is 12:37. It’s Tuesday and the month is June. The year, Herbert tells us, is the not too distant future and some madman, somewhere has pressed the button and five nuclear missiles have detonated over the city. Domain is 421 pages long and is split into three parts: Advent, Aftermath and Domain. Part one, Advent, sets the stage, so to speak, and introduces the main characters. There are quite a few of them too. Until the rats get to work anyway. The main character in Domain is a man called Steve Culver and he first shows up in chapter two when he rescues civil servant, Alex Dealey, and drags him under cover when the first bomb detonates. This is an act of courage that probably saves his own life as well because Dealey was on his way to a secret government shelter and he offers to take Culver with him. The two men then have a race against time to reach the shelter before the radioactive fallout reaches them. It is a hard race to run as well because Dealey has been blinded by the blast and Culver has to lead the way. The main entrance to the shelter has the remains of a fallen building sitting on top of it and so culver and Dealey have to use another entrance, hidden in the city’s subway tunnels and it is while they are searching the tunnels that the rats make their first appearance. The rats have been hiding for years, but can now sense a change in the balance of power: man is weak and scared, disorientated and easy game for the ravenous rodents. Culver and Dealey do make it to the shelter—t is touch and go for a while though—but before they reach it Culver gets the chance to play the hero again and saves a young woman (Kate) from the rats. Culver proves himself to be a hero time and time again. He isn’t the only hero in the book though, and when he teams up with an engineer called Fairbank they make quite a team. Part Two of Domain is set a month later and finds Culver and Fairbank leading the first small expedition out of the shelter and they find that things are not looking good topside. The city has been reduced to rubble, the few survivors that they meet are dying of radiation poisoning, and the local wildlife is so wild that life is going to be a lot more difficult than they ever imagined. When one of their party is injured they head back to the shelter, only to find that the balance of power has changed during their short absence. By part three of the book the number of survivors has diminished significantly, but they are out of the shelter and, under Dealey’s guidance, are making their way to the main government shelter to try and hook up with any other survivors—if there are any. I did not enjoy Domain as much as I did the previous books. I am not sure, but think this could be because the story is set in an apocalyptic world. In the other two books everyday people were getting killed by the rats in everyday places: at home, at work, in the woods etc. So it was very easy for me to picture it. There is also something very scary about the idea of everyday places suddenly becoming fraught with danger. An apocalyptic world is, however, harder for me to identify with because it is still—thank God—an unknown. There are plenty of graphic scenes that depict the ripping and tearing of flesh as armies of giant rats bare their teeth and claws and do their bloody worst to the survivors, but overall, the book just doesn’t work for me. I’m glad I read it, but I don’t think that it is one that I will read again at a later date. But that’s just one man’s opinion. I have read a few other reviews of Domain and some people consider this to be the best out of the three books. I think if you have read the other books you will probably want to read this one as well. If you haven’t, I think it is probably worth my mentioning that Domain contains completely different characters from the other books and is written in such a way that it can quite easily be read as a stand alone novel.